Ashton Kutcher is pretty much known for his comedic stylings, but he has been known to show up in dramatic roles as well, like Steve Jobs in jOBS. I’m not sure if I’ve actually seen him in anything really dark and suspenseful, like in The Butterfly Effect. Now, I’ve seen this film two or three times before. I stand by my saying that it is a very well done film. I’ve also seen the two sequels, which I’ll get to soon enough – but I’ve only seen those once because they weren’t as good. If I can remember, I rated them from best to worst – 1,3,2 – but we’ll see how they stack up nowadays. 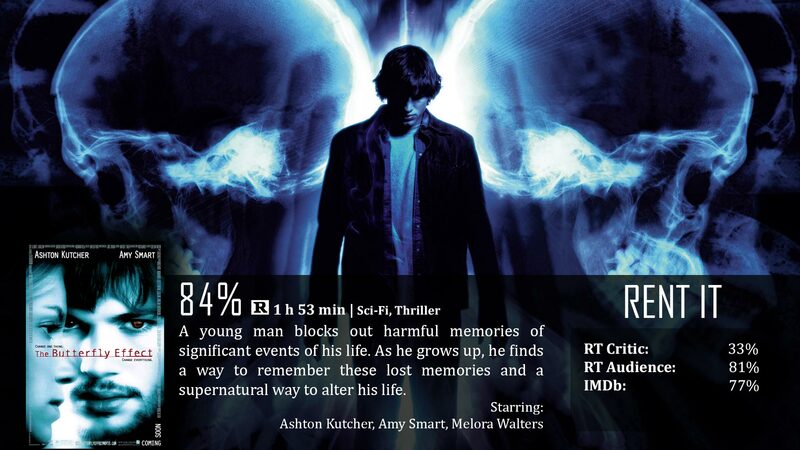 So, you’ve all heard of the butterfly effect that this film is based off of, yes? Well, I’ll tell you if you haven’t – basically it’s a time travel theory that if you changed anything, even the slightest thing like a butterfly wing, it could change everything in the worst way possible. Basically – it’s a bad idea. Well Ashton Kutcher plays Evan, a guy that learns he has the ability to look at his own journals written as a boy and travel back in time to that exact moment. When he was a kid, he would have black outs – when he travelled back in time, he went back to those blackout moments. Well anyways, the gist is – every time he changes something for the better, something goes horribly wrong in return. You have got to love the concept of this film, reading your old journals, which send you into the past. Journals already do that in a more metaphorical way, but this kind of takes that idea and makes it epic. I will say that with every time travel film comes some kind of plothole that’s hard to ignore – because time travel doesn’t exist, a screenwriter gets a lot of his own stuff wrong. Let’s take a scene in the film where he proves his abilities to his cellmate by creating scars in his hand. Well, creating those scars is creating history, the cellmate wouldn’t see the change – to him they would have always been scarred. Little things like that just don’t make a lot of sense, but the movie is still a lot of fun. It makes you think, because we’ve seen time travel before in film. Plenty of times. We haven’t, however, seen it done like this. It’s about accessing memories in a completely different and unique fashion. They took an idea like that, and they built on to it with the genre and theme. That’s where the darkness of the film comes to play, and they actually explain why it is so dark and messed up to begin with. You ask me, the answer is pretty smart. It’s not without its flaws, but the way it is put together is pretty solid and seamless. You need great actors for this type of film because when you change history, you change personalities and attitudes of the people that surround you. That means everyone in the cast needed a good acting range. Happy, sad, angry, upset, scared, depressed, mute, sick, abused, scarred….you name it. That’s important to convey a believable shift in history, and they did a fantastic job at doing that. Even now, this is one of the more unique concepts of time travel in film. The dark tones and varied acting abilities from everyone is so well done, and the way it ties all of the scenes together is honestly just really, really cool. It’s not a film to miss. It’s kind of a weird movie for a lot of people, which sets them off when it shouldn’t. The time travel itself is more realistic than what the movie looks like. The tones are overbearingly dark in a way that doesn’t make a lot of logical sense. Not only that, but there are some obvious time travel plot holes that were overlooked. Jason Treborn: You can’t change who people are without destroying who they were.